Adis says: Hello! Welcome back to the Quicksketch Sundays! Now that the holidays are over and we're back to the turmoil of our daily lives, our regular activities may resume and so, here he is: Petie Shumate, creator of Labgoats! And that's my artwork. I tried to go for that stark, aseptic feel science sometimes inspires. Anyway, here's what Petie had to say for himself. I�ve never been able to come up with a proper hook for the strip. Labgoats started out as a somewhat autobiographical strip about me and my roommate, but it quickly went into fanciful territory. As it stands now, it�s a strip about five graduate students trying to make sense of the world around them. Your comic's been around for a while, what was the webcomics' landscape back in 2001? I was quite na�ve to the webcomics scene then, but to my best recollection, the most obvious difference was the size of the field. When I started on Keenspace, there were around 2000 accounts (about 1300 of which were active, I believe). Keenspot was about half its current size, and the Modern Tales empire had yet to be formed. Big Panda was breathing its last. Most of today�s big comics were also big back then, though (PVP, Penny Arcade and Sluggy Freelance immediately spring to mind). The time of being able to gain immense popularity due to just having a webcomic was drawing to a close, though. It was becoming less cool to just make a webcomic. You had to start doingit well. All of the niches had been adequately filled, so you couldn�t just claim first rights and live off of that. The webcomic community was starting to form, as well. People had found they weren�t the only one who had this amazing idea of putting a comic on the web, and started to band together. I guess I remember more than I thought I did. Why start a webcomic then? Or at all? Labgoats was partially started on a whim, and partially on an abiding notion I had. I�d started reading webcomics about a year and a half before I created one. I began with Sluggy, PVP and General Protection Fault, and had found Keenspace in March of 2001. I immediately became hooked on a few Keenspace strips (FRAMED!!! and Boxjam�s Doodle grabbed me and refused to let go). Once I saw that hosting specifically for webcomics existed, the idea to create one started forming in my mind. Of course, I didn�t know what the comic was going to be about. I didn�t really know much about comics in general, except for having a love of Bloom County. But golly, webcomics were cool, and I wanted one of my own. That�s where Todd Morris, my roommate and co-creator of Labgoats, came into play. He knew very well that I had a habit of picking up a hobby, and immediately dropping it in a week. If a project lasted a few days, I was able to finish it, but I could never sustain a long project. We�re out driving one night, and he asks me, "Hey, Petie, we should start a webcomic." So we get home, hammer out two characters (Del and Harold, loosely modeled after me and Todd, respectively), and I proceed to work on character sketches while he writes the first script. 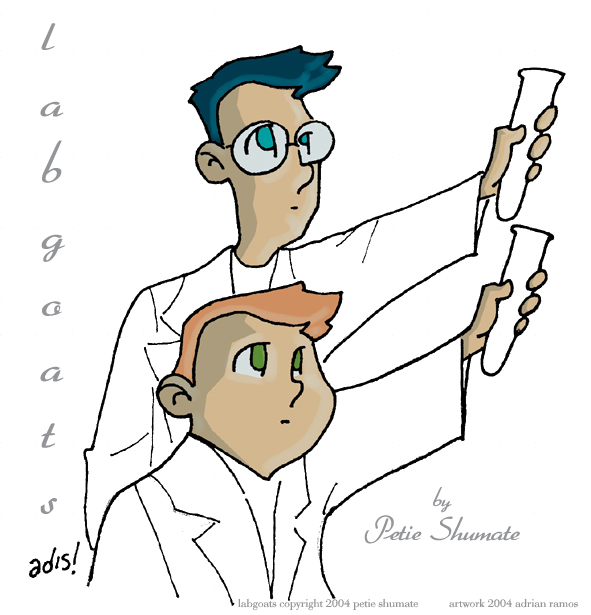 And on May 11, 2001, the first Labgoats strip was uploaded. Your style has improved a lot. Are you sure you aren't spending more time drawing that studying? My boss has wondered that on more than one occasion, and it almost led to me ending the comic. Okay, here�s where I get all "Behind The Music" on your audience, except I never had a crippling drug addiction. There has been two separate occasions where I almost quit comicing. The first was in the summer of 2002. I felt that the comic was becoming stagnant, that both my drawing and writing would never improve to the point where I�d be happy with either of them. I ended up making Flash models for all the characters, and trying to create comics with Flash. I never managed to do that well (fellow QuickSketcher Chris Paluszek of Carzorthade amazes me with his ability to do Flash comics so well), but it did lead to the first coherent storyline I�d ever done. Ironically, trying to improve the art ended up improving the writing. The second time I almost quit was in November of 2002, immediately following my initial research review (a presentation required of all Ph.D. candidates). I hadn�t adequately prepared for mine, and gave a rather nervous presentation. My boss very angrily told me, the minute my committee dismissed me, to give up comicing. And you can see a large gap in my archives from that time. I just didn�t feel like drawing. Of course, the boss had bothered me so greatly that I didn�t feel like researching, either. I was in a pretty deep funk. If the first comics of 2003 seemed a bit somber, that�s because I was trying to work out some feelings I�d had. But even that helped me to become a better writer. I consider my style to have improved in two ways. There�s a gradual improvement that comes from drawing the characters everyday, becoming familiar with them and drawing in general. The second type of improvement is drastic, happening overnight. You can look through my archives and tell when this has happened, because the characters will look different than they did in the previous comic. The most recent change happened after my Edward Gorey Halloween special. I decided to focus heavily on backgrounds and inking. Also, I started an ongoing storyline for the characters. I�m only now becoming comfortable telling people that I draw a comic. You've also had plenty of guest artists, all who seem willing to help you out at all times. Care to name a few of them? I�m blessed with the absolute best friends in webcomics, both in and outside of QuickSketch. When I�ve been in a funk, or just needed a few days off, they�ve been there to fill in. I want to thank them here. Jesse Barton (Mr. Kraw on my forums), Nicholas "Captain Spam" Killewald of The Dementia of Magic, Dave Flodine of Floyd Cartoons, Matt Trepal of Fight Cast Or Evade, Teague Tysseling, Chris Paluszek of Carzorthade, Spencer "Crazy Kiltman" King, of Therefore Comics, Joel Woodard, Nick Doggendorf of Mecha Battle S.U.I.T. 's and Lisa Edmonds (upcoming guest strip), thank all of you for helping me when I needed it. I hope I can help you likewise. If the strip began as slightly autobiographical, which character is supposed to be you? Del is the character that most represents me, both physically and emotionally. The other characters started out as representative of other people (except for Laura, she was based on no one), but they�ve started to take on aspects of my personality. Harold is my academic side, Laura is the part of me that�s indignant and seeking acceptance, Stan is my mischievous side, and Steven J is my inner redneck. You know, back in junior high and high school, nothing seemed more uninteresting to me than Chemistry, and science in general, and I couldn't believe why would anyone want to devote their lives to it, when there was music, art, films, literature, comics and so on. My mindset has changed since then, and now I'm able to see the appealing aspect of science, but I still like to ask, whenever possible: Why become involved in science in the first place? I�ve always loved making messes. I got a chemistry set in grade school, and I�d spend whole afternoons using phenolphthalein to turn lye pink. I also really loved math, and in high school, both of those ensured I got As in chemistry. When it came time to apply to colleges, I decided on chemistry, because I�d grown to love it and teaching. It�s often said that no one likes chemistry; people are just good at it. I don�t think I�m particularly blessed with a scientific mind at times, but I love chemistry. It�s one big puzzle, and I�ll never solve it. It�s comforting to know that. You had a co-author, whatever happened to him? Todd quickly handed over all comicing duties to me once he saw that I was serious about cartooning, and that it wasn�t just a passing fad. He wrote the first 5 or so strips, a few a year later, and drew one strip when I broke my left index finger. What can we expect from Labgoats in the future? There will be an ongoing continuity that�s been lacking from the previous strips. There will be one more character introduced soon who will challenge a lot of what I�ve thought about science. I still plan on being funny, I just want my readers to start thinking a bit more. There will probably be little stylistic changes, except for maybe a font that�s more legible at the size I�m currently using. Which one do you think would most likely break something in the lab: Laurie, Katie, or Ship? Thanks a lot to Petie for his time and his honest answers, and remember to visit Labgoats!